The Strange Invisible Perfumes Signature Collection comprises 18 fragrances created by Alexandra Balahoutis. 10 of them will be on counter at Barneys in October. All are in parfum concentration, and let's just get the bad news out of the way: they are not cheap. They run $185 for 1/4 oz. 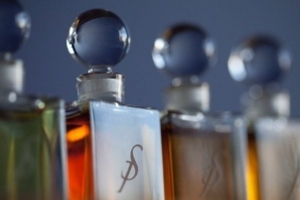 The good news: these are well-crafted and unusual perfumes. I did not love all of them, but not a one bored me, and I found a few of them startlingly beautiful. They are not the sort of thing that you buy to impress your co-workers at a business meeting or to attract a mate; they are perfume-lover's perfumes, made for people who like to smell things. They require patience: several of them have difficult top notes, and develop very slowly, over a period of some hours. Heroine has notes of opoponax, cedar, ginger, tuberose, and frangipani. The opening smells like tuberose mixed with something unpleasant — not the wintergreenish medicinal rub of Serge Lutens Tubéreuse Criminelle, but more like a mixture of melting plastic and gasoline. It resolves gradually into a huge blast of cedar, which temporarily drowns out the tuberose. The cedar fades slowly to a whisper, leaving just enough behind to ground the heady notes of tuberose and frangipani. It is lush and rich, but not overly sweet, and the ginger, while soft, adds a little kick to the florals. Lovely and long lasting. Black Rosette has black tea, rose, leather, and spearmint. Another odd opening, with lots of hazy medicinal stuff (very like agar wood) floating over mint and leather. The dry down is an assertive mix of animalic leather, smoky tea leaves, and rose. It is a dark, earthy, atmospheric fragrance, and after an hour I decided that while it was way cool, it wasn't something that I would wear. After 2 hours, the hard edges of the leather had smoothed, the fragrance had taken on a deep, rich wood note, and I was completely captivated. L’Invisible is the namesake fragrance of the line, and features oak moss, resins, ylang ylang, blood orange, hibiscus, vanilla, rose, and lemon. It has a more conventional opening than the two fragrances discussed above, with dry mosses and floral notes over resinous undertones. The ylang comes on first, with the sweetness cut by the citrus notes; the rose arrives much later with a hint of vanilla. Hours later, it is a soft, close to the skin blend of oak moss and light resins with just a hint of flowers. Other fragrances that will be available at Barneys include Aramaic (for men, with blue lotus, holy basil, cinnamon, agarwood, cardamom, and frankincense), Arunima (with blue lotus, vanilla, frankincense, lavender, ginger, cardamom, and key lime), Atlantic (for men, with benzoin, sandalwood, lavender, bay rum, peppermint, key lime, and frankincense), Eleuria (formerly Con Brio, with frankincense, musk rose, iris, jasmine, and vanilla), Étrange (with far eastern flowers, resins, ginger, benzoin, and seaweed), Galatea (with ambrette, neroli, benzoin, galbanum, and tuberose), and Tosca (with mimosa, jasmine, basil, parma violet, tobacco leaf, pale musk accord, bergamot, and orange blossom). For buying information, see the listing for Strange Invisible Perfumes under Perfume Houses. Tomorrow: Strange Invisible Perfumes Lady Day. Thanks very much for tempting me to try and get hold of some samples. Fab reviews as always dear R. I like the fact that these perfumes did not bore you – that my dear is a good sign. Hmmm – maybe I will pass and test some other time. N, that is right, they are very expensive, although if you look at the price of a bottle, the samples (which are 1 ml) are actually not bad in comparison. Also don't know if they ship overseas. Thanks R! I will pass. Thanks S, I didn't know about their shipping. Billie Holiday is one of my very favorites, along with Ella Fitzgeral & Sarah Vaughan. Someone needs to do a perfume for Ella! Thank you for beautiful reviews! I am looking forward to the line coming to Barneys, which should make sampling much easier. Cannot wait to read your review of Lady Day. PBI V and R – I will hopefully be visiting the US some day soon – I know what to raid! Thanks S – like you I am horrified at the price. That's why I made the joke the other day to see if R had negotiated a price break for us on the samples. not only are they $$$, I believe they only contain a few drops. I have not confirmed that last bit, but Yow! I read somewhere that her mother, who is reviving a Kentucky town singlehandedly, encouraged her to open a store there, which she did. I can imagine the stuff can be sampled there, also. A google search should help find the site. What bewilders me is that the town is rather rural, and who in the heck there can afford the 'fumes? Even tourists would get sticker shock outside of LA or NYC. Aren't I the font of weird and obscure stuff? LOL. A, the samples are 1 ml, so yes, $$$, maybe even $$$$, but as I said above, much cheaper per ml than buying a whole bottle. I did not know she had a store in Kentucky, and a google search was not helpful on that score. Maybe it is still in the planning stages? L'Invisible might be my favorite of the SIP line. It reminds me of aromatic chocolate covered orange cremes. :):) However, I want to test Galatea and Heroine. I think that Halyna and I will visit her new boutique when it opens. Halyna is a big fan, even took a perfume class taught by Alexandra two summers ago. Her favorite is Lyric Rain, which may be a patchouli lover's dream. I don't know if I would buy a bottle of her perfume, but the samples are beyond generous. As I recall, they come in those little black screw cap glass bottles that many MUA'ers use for small decants. It may be the 1/16th ounce size. R, L'Invisible is beautiful, and so is Heroine. I need to give Galatea another try but it was not love at first sight so I concentrated on the 3 I reviewed above. I did not know AB gave perfumery classes. I have never been tempted to create my own, but would love to have her do a custom scent. She can do that, too! I bet she comes up with some wonderfully imaginative custom scents. I don't know, she is harder to capture! Good grief! Those prices are ridiculous! What is the rhyme or reason? It is all moot to me since my budget doesn't allow me to spend that much on a bottle of perfume, but I don't find it offensive in the same way as many of the brands that seem to jack up the price just to create an aura of exclusivity. L, I am still figuring out your taste & can't decide if you will like them or not. Will be interesting to see!